Have you ever made a mistake so embarrassingly simple that you felt like a complete fool?–like turn your wrist to look at the time on your watch and spill the cup of coffee in your hand, or tear the house apart looking for your keys when you left them hanging in the front door, key still in the lock? Before I tell you how this is relevant to my trials in small-batch cupcake making, answer the following question for me. Does baking powder come in a box or a can? In the 20 or so years I’ve been baking cookies, cakes, and muffins, baking powder comes in a can while baking soda comes in a box. You know the box–the yellow one with the bent arm, a hammer clutched in its muscular fist. Well, take 20 years of habit and therein lies the problem with the first three batches of cupcakes that I made but couldn’t eat without a salty, metallic flavor lingering in my mouth after each bite. You see, Trader Joe’s, imprudently believes that baking soda comes in a can, not in a box. Thus, what I thought was baking powder, I discovered was actually baking soda when, upon reading an info blurb on the side of the can, I said to myself, “I didn’t know you could use baking powder to freshen your fridge? !” It was then that I turned the little round canister around to read, for the first time, the words “baking soda” printed right there on the front of the container (hangs head in embarrassment). I thought seriously about keeping my little faux pas to myself, but after having lamented in a post last week about why all these cupcake recipes sucked, and that they tasted so funny, I had no choice but to make my ignorance public. Consequently, I had to try all of the recipes over again with the correct ingredients until I had found the perfect small-batch cupcake. At long last, here it is. And, I have learned a valuable tidbit of wisdom, which goes well beyond the kitchen, that I hope you will all benefit from–maybe it will even become a charming parable about not being able to see the forest through the trees, like the one about the generations-old tradition of cutting the end off of the roast when the only reason it was done in the first place was because great-grandma’s pan was too small. The lesson is this: if at first you don’t succeed, don’t “try, try again” until you figure out why it didn’t work in the first place! Sure, it lacks the idiomatic charm of the original, but it’s better advice. Now, onto some cupcakes! This recipe makes 6 standard-sized cupcakes–just enough not to have them calling your name from the countertop for days afterward. The ingredients are an important factor in making these cupcakes great, but the method of mixing them is also key. 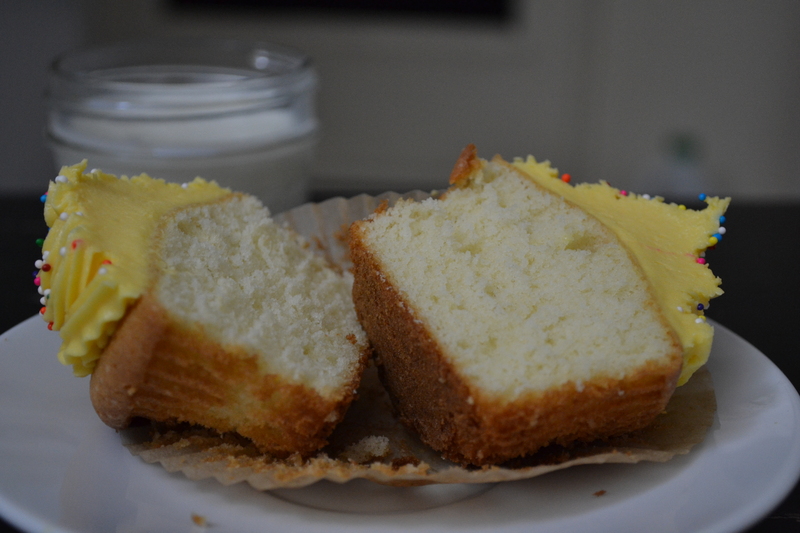 I tried this recipe using the traditional “cream the butter and sugar together, add the eggs… way” and they were decent, but after reading the America’s Test Kitchen method for making yellow cake, I tried it the way I have written it here, and they were outstanding. These cupcakes are tender and moist, and the flavor is buttery but not too sweet–a job left for the frosting, which only serves to complement the cake, not be the focal point. I hope you enjoy them as much as I have. Preheat your oven to 350°. Sift the flour, sugar, baking powder, and salt together in a medium bowl. Measure the milk into a small bowl. Beat the butter and a teaspoon or so of the measured milk into the dry mix with an electric mixer. The mixture will come together to form pebble sized pieces of batter when it is completely mixed together. Add the egg and vanilla to the bowl with the milk and whisk them together with a fork so they are just combined. Add the egg mixture to the flour and butter mixture and beat together for 30 seconds or so, incorporating some air into the batter. 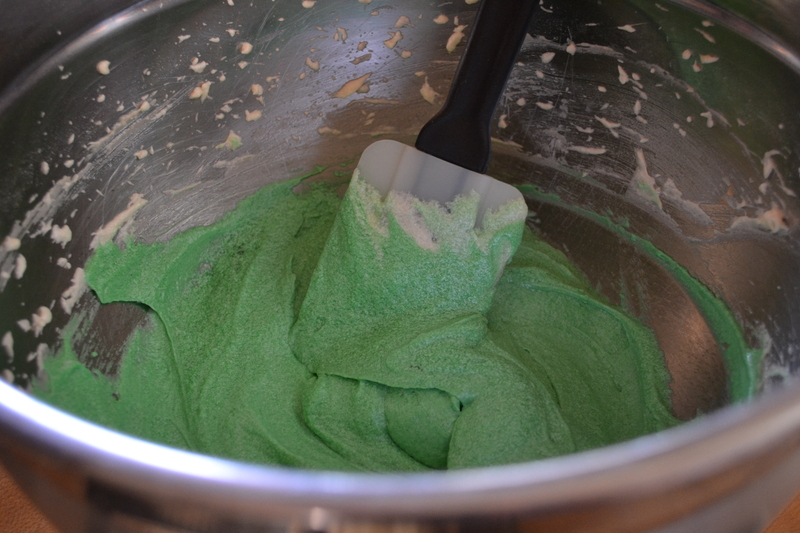 Spoon the batter into your paper-lined cupcake pan, filling about 2/3 of each cup with the mix. Bake them in the center of your oven for 18 – 20 minutes, taking them out as soon as they are just starting to turn golden, but well before they have browned. A toothpick inserted into the center of a cupcake should come out dry. When they are done let them cool for at least 10 – 15 minutes before removing them from the pan. Don’t frost them until they are completely cooled, which usually takes another 30 minutes or more, set in a cool place. To make the frosting, beat the softened butter, powdered sugar, milk and flavorings together with a hand-held mixer until it is smooth and slightly fluffy. Add as much or as little food coloring as you want, and either more milk or more powdered sugar to get a consistency that is soft enough to spread, but firm enough that it stays in one place. Decorate with sprinkles, if you have them. I use an icing bag to frost mine, but they don’t taste any different if you just spread the frosting on with a knife or spatula. I made these again just yesterday, and in the spirit of St. Patty’s Day, I added green food coloring to my cupcake batter and to my frosting. They’re a whole-lotta green, but what is St. Patrick’s Day if not a holiday for excess! Make your cupcakes whatever color the occasion calls for, or just dye the frosting, which is always tasteful. They will taste better if you don’t refrigerate them, but if it’s very warm then you will need to keep them in the fridge or the frosting will melt. Better to just eat them the day you make them, which is a lot easier when there are only 6 of them. 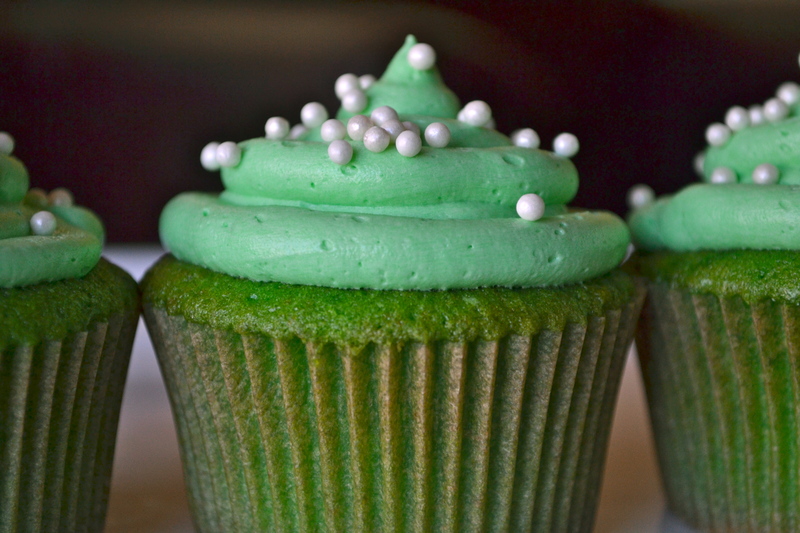 I was worried that green frosting on a green cupcake might be overkill, but I was assured that there’s no such thing when it comes to St. Patrick’s Day! Glad you liked it. 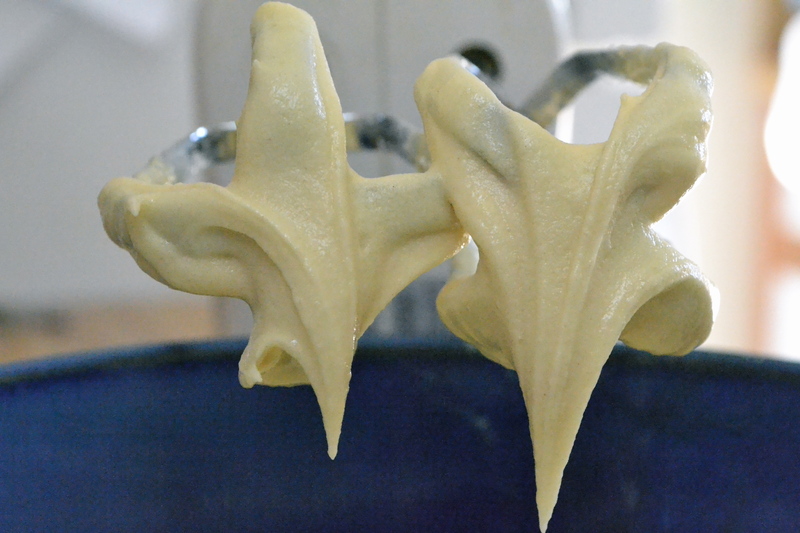 you’re lucky you were making small batches. i once used cake flour instead of all-purpose to make scones. i didn’t realize until i found the batter to be too wet. It was lucky that I only ruined 5 or 6 cupcakes instead of 12 – 16 of them. Incidentally, my oldest son thought they were great, and ate more than one in the first batch I made. Good thing a little extra baking soda can’t hurt you. « Don’t Throw Out Those Ugly Bananas! Make Banana Bread.